Is your portable media player getting banged and bruised as you carry it around? Is the beautiful "brushed metallic" surface looking bruised, or accumulating ugly finger smudges? Or, worse, did a key in your pocket scar the screen? You can get fancy cases and carriers to protect your media player, in snazzy colors and with cute animals and bright rainbows, but these take up more room and can make it clumsy to access the controls. Or you can wrap your player in a thick layer of bulletproof plastic -- or at least something close to it -- ZAGG invisibleSHIELD Protective Film. invisibleSHIELD is a clear, thin adhesive film that provides tough and durable scratch protection for a wide variety of gadgets. 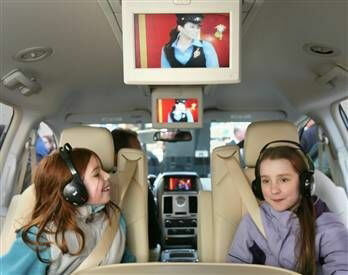 The film is a clear urethane plastic, with self-healing and abrasion resistance properties. It's based on a material used to protect the leading edges of helicopter blades in the U.S. military. The InvisibleSHIELD covers are custom designed for each device, available both in front cover screen protectors and full-body wraps that protect the entire device, including the screen, front, back, edges, corners, and sides. Covers are available for some 2,000 specific devices, including iPods, MP3 players, cell phones, smartphones, PDAs, game systems, GPS devices, digital cameras, laptops, and even watches. Prices for front covers to protect phone and music player typically range from $9.95 to $14.95 (for the iPhone). Full body covers range from $19.95 for smaller devices like the iPod nano to $24.95 for larger devices like the iPhone, iPod classic, and LG chocolate phone. And you can protect your notebooks, with protection for the MacBook Air including wrist rest coverage for $24.95, standard coverage for $39.95, and full body for $54.95. What's great about the InvisibleSHIELD, besides the protection, is that it is so non-obtrusive -- so thin that you don't even notice that it's there. So the video iPod, for example, still slips snugly into its small case. See the InvisibleSHIELD site for videos showing the installation process and strength tests. 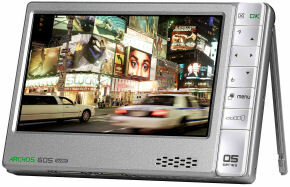 See my Portable Media Players Gallery for information on players and accessories. More and more consumers are facing growing collections of media stuff -- music and photos and video -- and facing the desire to get organized, be creative, and share their digital content. But there are some many media formats, stored on a bewildering variety of mediums, and so many ways to share, electronic and on physical devices. Thus the attraction of digital media software suites like Nero 8 Ultra Edition and Roxio Easy Media Creator 10, which have grown from their origins in CD copying and burning to add an array of tools for media management, editing, and sharing, along with more general data backup and archiving. The latest releases also have have picked up on the hot trends in digital media, building in support for importing and editing new formats, and sharing even more broadly across discs, portable devices, and electronically. But all these new features results in piling on even more functionality to already-bursting suites: Nero 8 now includes some 22 applications, and EMC 10 has some 12 major applications plus 18 additional utilities/assistants. As a result, these new versions have also focused on refining the user interface, especially with the new look of Windows Vista. They provide a main launcher / control panel to help users choose the task they want to achieve, and now build in direct connections to the product websites for information and updates. Roxio regards EMC 10 as a substantial upgrade to its flagship suite of digital media applications, with the focus to "enable consumers to quickly and easily turn their photos, video and music into impressive multi-media projects that can be shared on CD, DVD, the Web, or a range of mobile devices." And Nero has reworked the interface for consumer ease of use, and focused on "extending content beyond the PC" with "easy-to-use features for the creation, management, and protection of multimedia projects" -- To create and edit, convert and share, rip and burn, and backup and protect digital media. So if you're looking for this kind of all-in-one solution, with the broad range of capabilities -- import, edit, and share -- across images, music, and video -- then check them out. I'll be back at Princeton this Wednesday, April 23, to talk about trends and technologies in portable consumer electronics devices. I'll have lots of fun devices to demo, working from the trends and products showcased in my Digital Media Galleries. This seminar series is free and open to the public -- Bring your lunch, but come early for cookies. Frist Campus Center is on Washington Road, downhill from Propect Ave. and the Woodrow Wilson School, and before Ivy Lane and Guyot Hall. After releasing Roxio Easy Media Creator 10 in September 2007, Roxio now has shipped three subsets of the full EMC suite for specific applications: Disc copying (Easy DVD Copy), DVD authoring (MyDVD), and music creation (RecordNow Music Lab). Released in February 2008, these are designed to "enable consumers to make the most of their digital libraries," so that users can "easily turn photos, videos and music into impressive digital media creations that can be shared on CD, DVD or enjoyed on a variety of portable devices." Roxio DVD Copy 4 Premier is focused on DVD copying and video conversion ($49). Copy non-encrypted DVDs, shrink dual-layer DVDs to fit on single-layer discs while excluding unwanted content to optimize video quality. Convert popular audio and video formats for playback on portable devices. Also copy TiVo shows, and copy unprotected videos from the iPod to hard disk. Roxio MyDVD 10 Premier is designed to make it easy to quickly turn photos and home movies into polished video or DVD productions ($69). It features MyDVD for creating movie or slideshow discs, VideoWave for video movie creation, and PhotoSuite for photo editing and sharing -- along with associated tools, especially for automated production and enhancement, and sharing to portable devices. Roxio RecordNow Music Lab 10 / Premier is designed to, rip, convert, transfer and enjoy music on your computer, and share on disc and portable devices ($29, Premier suite for $69 adds DVD music discs). Collect music from CD, DVD, LP, tape, Internet, and iPod. Capture computer audio, including Internet radio and streaming music, transfer tracks from multiple drives, capture and clean-up analog tracks from LPs and tapes. Organize and automatically tag tracks. Batch convert to digital formats. Automatically create playlists based on your preferred songs. Bottom line: Adobe doesn’t claim ownership of your content and won’t sell your images. Again, be sure to check the terms for any site where you upload your personal work -- You may be surprised to find you've essentially lost control of your work, while the site can profit from it in any way. Coming from a name like Audio-Technica, with its background in high-performance audio for home and professional use, we had high expectations for the Audio-Technica ATH-ANC7 QuietPoint Active Noise-Cancelling Headphones. And we were not disappointed; With a list price of $219, but a street price of around $119, these headphones clearly delivered better sound than other noise-reduction products in the $100-plus price range (see previous posts on Headphones). Audio-Technica rates the QuietPoint active noise reduction as up to 85%, a similar claim to competing products -- although A-T goes further to spec the reduction as up to 20 dB. The performance is certainly at least as good as other sets we've tried. But the big difference is in the better, more accurate sound. Noise reduction can result in a somewhat muddier sound, especially for higher frequencies. But these A-T headphones had no such problem -- the highs came though well. We were most impressed by the clarity of the headphones. The lows and mids sound very rich and satisfying, and the high end was very pronounced without being grating or tiring to the ears. If you're tired of wrangling power cables for your various devices, especially when packing for trips, take a look at today's universal chargers -- just one power cord, plus individual adapter tips for your specific devices. You can find a wide variety of these -- small and large, for cell phones to laptops, with and without batteries. But if you have a bunch of handled devices, check out the Callpod Chargepod -- a power hub that simultaneously charges up to six devices. Adapters are available for devices including cell phones, Bluetooth headsets, music players, PDAs, portable gaming systems, digital cameras, and other mobile electronics that operate in the 5 to 6 V range. The hub itself is small and light (around 2 1/2 in. diameter and 1/2 in. thick) -- the power brick is larger (2 x 3 1/4 x 1 1/8 in.) The hub has individual LEDs on each port, which light up when an adapter is connected (although not necessarily charging). The base unit is around $49 without adapters, or $89 bundled with a car charger and 6 popular adapters. Individual adapters are $9.95. 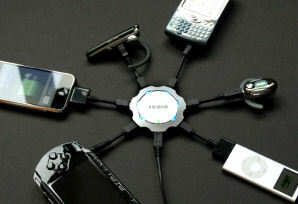 See my Portable Power Accessories Gallery for information on power chargers and adapters. The Fromm Works Quik Pod is a clever little extension rod for getting your camera up, under, or over to shoot away from your body -- or to turn the camera around to shoot you and a friend on location. It telescopes 7 1/2 to 18 inches, weighs 3 1/2 ounces, holds small cameras up to 16 ounces, and costs $24.99 (see previous post). Now there's the Quik Pod DSLR -- the same idea, but bigger and better. The Quik Pod DSLR extends from 18 to 53 inches and weighs 9 ounces, which makes it usable both as a longer extension pole, and to sit on the ground as a monopod. And the larger size means it can carry more weight -- up to 2 pounds as a pole and 6 pounds as a monopod -- which opens up additional uses such as holding digital SLR cameras, camcorders and portable lights. All for $49.99. The design includes three locking claps for the telescoping sections, and two screw-on end caps for the handle: rubberized monopod or machined aluminum. The product also includes a gel pad for bracing the handle against your body, wrist strap, hiking clip, and carry bag. The other end has an adjustable camera mount with a quick release platform. Platforms are available with friction locking (continuous) and gear locking (stepped). Plus there are other Quik Pod accessories available, including a suction base, magnetic base, and standing adapter legs. It's the quick way to reach out and shoot some great photos. See my Consumer Digital Cameras Gallery for information on photo accessories. Even in the age of Web video, we still love sharing photos. And digital photo viewers make great gifts, with customized photo shows. But aren't such dedicated devices obsolete in this age of convergence, when you can carry your favorite photos on your mobile phone or media player, and access them dynamically from the Web? I like having our favorite shots always at hand on my Palm Treo -- they're great for explaining art projects or our brick in Vegas. But I'm not so happy to hand around my personal phone for others to look at, and I'm certainly not going to give it away as a gift. So digital photo viewers do make sense, with both larger screens to display in your house (see previous post), and with smaller screens for sharing and for gifts. For example, the Digital Foci 1.5" Keychain Pocket Album is a tiny viewer (2.2" x 1.6" x 0.5", 1.2 oz. ), with a 1.5” color LCD screen, 128 x 128 pixels. It displays up to 74 photos from the 8 MB internal memory, and is available in black, silver, and blue for $29. 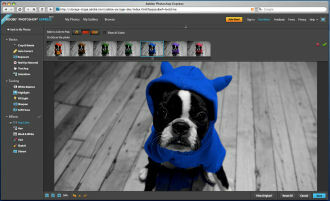 You can scroll photos manually or run a slideshow with adjustable time interval. It has a simple menu to set the slideshow duration, display contrast, and clock overlay. The battery lasts to 9 hours, and recharges using USB power (connected to your computer, or using the included AC-to-USB adapter). Digital Foci includes Photo Viewer Software for PC or Mac to convert and download photos (the Pocket Album is not directly accessible as a USB virtual disk). See my Consumer Digital Cameras Gallery for more on photo accessories. Digital photo viewers were tremendously popular gifts last Christmas season, as consumers were met with a flood of products from a huge variety of companies, some new to this kind of product. Unfortunately, some of these products were rushed to the market without much attention to niceties such as the menu interface, user controls, or the display quality. Then there are companies like Parrot, which has been focusing on wireless Bluetooth interfaces for applications including hands-free car kits, wireless speakers (see previous posts on Parrot), and digital photo frames. In fact, the first Parrot Photo Viewers were Bluetooth-only -- designed for receiving photos from mobile phones, or Bluetooth-enabled digital cameras and PCs. This actually made them more difficult to use for more basic users, and even people with experience with digital cameras, since you couldn't load photos via a memory card, or over a USB connection. 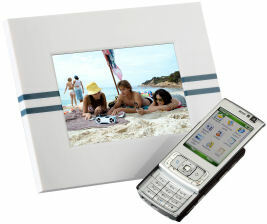 Continuing this wireless theme, Parrot developed the Parrot DF7700 MMS Digital Photo Frame for Europe, supporting a SIM card with a dedicated phone number built directly into the photo frame. You then can load photos remotely via MMS from a mobile phone, updating the slide show on the frame sitting in your family's house to show the latest great shots from your trip. A version of that design is now available in the U.S. as the Parrot DF7220 7" Photo Viewer. There's no MMS, but it adds connectivity options for transferring photos -- Bluetooth (wireless from a camera phone or PC), mini-USB (synched from a PC) and a SD / MMC memory card slot (direct from a camera) -- all for around $126 (street price). This is a nice design -- straightforward controls, clear menus, and swappable clip-on plastic outer frame. It automatically adapts the picture size to the screen and automatically rotates the picture when used horizontally or vertically (landscape/portrait). And you can set the on/off time, or have it power off when dark. The photo viewer plugs into wall power with a thin, white 7-foot power cord. The 10 MB internal memory holds some 300 photos, in JPEG and GIF formats. However, the color display is relatively low resolution for the 7" screen -- 410 x 234 pixels (vs. 320 x 240 for the iPod nano and classic, for example) -- so it's best for viewing across the room, and not up close like a hand-held media player. So load it up with your favorite photos and set it up on a table or a mantel -- or make a present of your memories. The NAB 2008 Conference (National Association of Broadcasters) wrapped up last week in Las Vegas. The NAB show spans acquisition, production, distribution, and delivery. Its historical core is high-end professional broadcast equipment, from high-end HD cameras to remote trucks with huge satellite dishes, but there's also plenty of interest for independents, especially in cameras, storage, and production software. This year's event was dampened a bit by the absence of both Apple and Avid, but added strong emphasis on emerging technologies including mobile video and IPTV. Attendance was down a notch to 105K, from 111K last year, although international attendance set a new record of over 28K people. See my full article - NAB 2008 Summary - for copious links on Trends, Products, and further Information and media coverage. While the Apple iPod line defines portable media players, there are a lot of other options if you're interested in alternate features, form factors, and designs -- see, for example, AnythingButiPod.com. SanDisk is focused on portable flash memory players, Creative has a broad range of models for specific needs, Samsung has developed some stylish designs with new features like Bluetooth, and the Microsoft Zune has entered the market with Wi-Fi connectivity. But if you're looking for something beefier -- a personal media player with a bigger screen and built-in speakers so you can share your music and photos and videos on the go -- then look to the Archos Gen 5 line. ARCHOS specializes in upscale players with similar designs: widescreen, 4" to 7" screen, some touch-screen, high capacity hard disk storage up to 160 GB, and a docking station for A/V capture. But the most interesting ARCHOS 605 and 705 WiFi models have full Internet connectivity with Web browsing, media playback, and e-mail. See my Portable Media Players Gallery for more information on portable players, from music to video, flash memory to hard disk, tiny to widescreen. Entries posted to Manifest Tech Blog in April 2008, listed from oldest to newest.